This past week I spent a short stay with a man near the Ballarat area. In order to respect his wishes, I will not give names or share photographs. This particular post will be a little less journal like and a little more about what I have learned so far and what I plan to gain more knowledge and a far better understanding on. 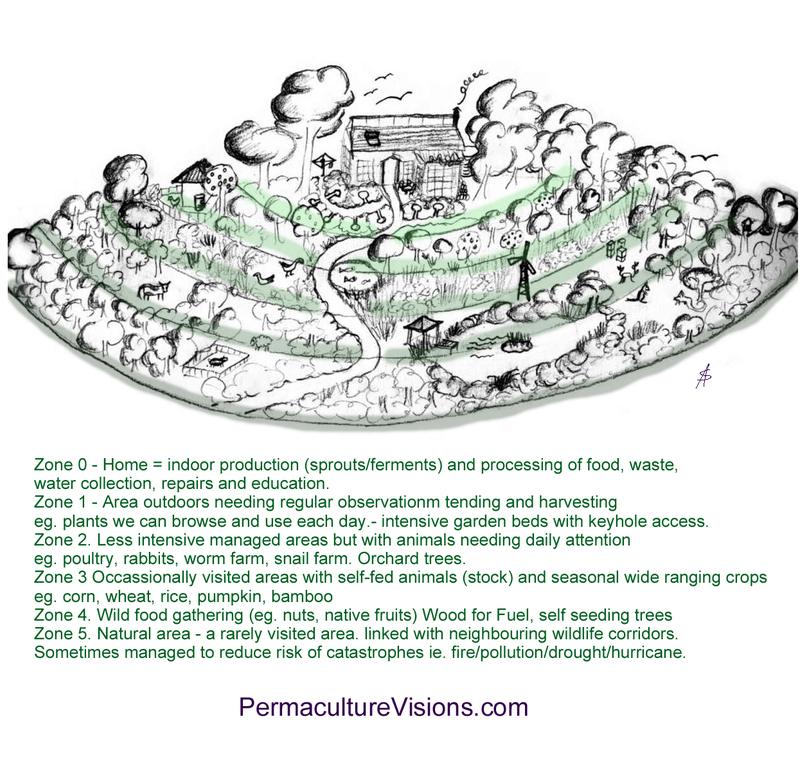 Permaculture uses a set of principles and practices to design sustainable human settlements. The word, a contraction of both ‘permanent culture’ and ‘permanent agriculture,’ was coined by two Australians…. (Bill Mollison and David Holmgren). Permaculture began… as a set of tools for designing landscapes that are modeled after nature, yet include humans…. Permaculture is not a discipline in itself but rather a design approach based on connecting different disciplines, strategies and techniques. It, like nature, uses and melds the best features of whatever is available to it. Observe. Use protracted and thoughtful observation rather than prolonged and thoughtless action. Observe the site and its elements in all seasons. Design for specific sites, clients and cultures. Connect. Use relative location, that is, place the elements of your design in ways that create useful relationships and time-saving connections among all parts. The number of connections among elements creates a healthy, diverse ecosystem, not the number of elements. Catch and store energy materials. Identify, collect and hold useful flows. Every cycle is an opportunity for yield, every gradient (in slope, charge, temperature and the like) can produce energy. Reinvesting resources builds capacity to capture yet more resources. Each element performs multiple functions. Choose and place each element in a design to perform as many functions as possible. Beneficial connections between diverse components create a stable whole. Stack elements in both space and time. Make the least change for the greatest effect. Understand the system you are working with well enough to find its “leverage points” and intervene there, where the least work accomplishes the most change. Use small-scale, intensive systems. Start at your doorstep with the smallest systems that will do the job and build on your successes. Grow by “chunking” —that is, developing a small system or arrangement that works well and repeat it with variations. Optimize edge. The edge, the intersection of two environments, is the most diverse place in a system and is where energy and materials accumulate or are translated. Increase or decrease edge as appropriate. Collaborate with succession. Living systems usually advance from immaturity to maturity, and if we accept this trend and align our designs instead of fighting it, we save work and energy. Mature ecosystems are more diverse and productive than young ones. Use biological and renewable resources. Renewable resources (usually living beings and their products) reproduce and build up over time, store energy, assist yield and interact with other elements. Favor these over non renewable resources. The idea, is that with these principles you can build an ecosystem from your doorstep on out throughout your property that requires minimal energy and stable and steady yield in all respects. You look at every single element, understand both what it takes to maintain as well as what it provides for you and you utilize it in every area where it will not only take your energy but provide energy in more than one way. Every element has more than one function. 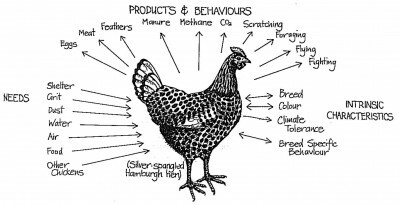 Your animals produce as much energy as they require in maintenance. Your food forest produces endless food with next to no maintenance and keeps the wild at bay from your personal gardens. Each piece of your garden produces either food or a means of protecting the food producing plants as well as helping them to grow. 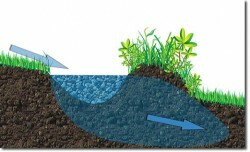 You utilize your property so that rainfall immediately flows to each section of your property that requires water using dams, swales, water tanks, catchment systems and ditches. Solar panels collect your energy and battery systems store extra energy. The list goes on and on and on. everything works together, just as it does in the forest outside of your property. You observe how the wild environment off of your property works together and you use what you find to build. When choosing trees and bushes for your food forest, be sure to get early blooming to late blooming varieties and plant all of them so that you are never without. Get different varieties of apple trees that bloom in Spring, Summer, Fall and winter so that you are never without apples, ect. Be sure to plant your trees and bushes first and then move on to the next piece of your property that requires equally as little maintenance. Take care of everything that takes care of itself first, then move onto pieces that will require maintenance. Try to focus on varieties of plants (trees, bushes, herbs… even veggies) that are self seeding. The more plants that continuously grow without you having to do a seasonal seeding the better. If you want to have goats for milking, keep in mind that they have to have a kid in order to produce milk. From that day forward do not miss a milking or they will drop their milk and you will no longer be able to get any from them. They will continue to produce milk for around 6 years. It takes a great deal of training and hard work to gain the relationship and trust that lets them allow you to milk them. A good “scolding” tool is water. They hate to be splashed. Use feeding time as a distraction when milking them. When it comes to your birds, such as ducks and chickens, be sure to use a key word or sound when feeding them. This allows you to get them to run to you if you need to get them to their pen or any other area in an emergency. (His chickens would come when you made a bocking chicken sound, no matter where you were on the property). When it came to water systems, he urged me to get a sloped property so that I could design my property on gravity fed water and irrigation systems exclusively. Pumps break down. The last thing he continuously urged me to do was to talk to the experts when it came to every material that we decide to use on our property. He learned the hard way that following the advice of random books and people got him second rate materials that needed to be replaced on a regular basis. Long lasting and renewable materials and resources are the key. The water and irrigation systems are what I am trying quite desperately to learn as much as I can about at the moment. Aaron and I like to joke (in a serious sort of fashion) that water is the meaning of life. It is the one resource that everyone and everything needs in order to survive. Wherever we move will have a good amount of rain fall and I will be working as hard as I can to design a system that takes the rain from the sky and directs it to every piece of our property that requires it, including the house, the garden and the animals. I don’t want to have to spend hours a day watering the animals and the gardens. I don’t want to have to worry about running out of water for showers or doing laundry. I know it’s possible to collect enough rain water to run a home because I have now visited two properties that manage it while accommodating helpers. I’m also learning what I can on solar energy. Both homes I have visited run entirely on solar energy. At the most recent home, my host had 12 kilowatts of solar energy that ran everything he did…. and he did a lot. He was not very frugal. This energy came from 5 solar panels. The house before that had one less and she hadn’t even figured out how to store the extra energy and was still getting on just fine. The solar energy appears to be the easier of tasks but I’m still working on learning about other methods of energy collection and storing. My next target of knowledge is learning how different plants work together. This will be a difficult thing to learn, especially since the vegetation here is different than what it will be wherever we move. But the concept is what is important to begin to grasp. If you build a garden with your vegetables and surround that garden with a plant that creates in the soil what the vegetables need as well as act as a deterrent to a number of the vegetable’s predators, you will be eliminating work for yourself. Certain herbs and even plants considered to be weeds do not “take over” an area and deter weeds that do take over. These are just a few of the key things to keep in mind when building your garden. My understanding is at its fetal stage and I hope that I can soak in enough by the time I need to build my own sustainable food gardens. One thing that was hard for me to grasp for a short period of time was the fact that you need to focus on what grows naturally, or at least easily, in whatever place you decide to live. A huge mistake that nearly everyone makes is to pick your favorite fruit trees, vegetables, herbs and the like and put in an excessive amount of work and effort, buying different kinds of soils and manures and sprays to make them grow in an inhospitable environment, as far as those particular plants are concerned. All of that energy and work will be unnecessary if you let go of your favorites, at least the ones that don’t grow in that environment without constant maintenance, and put in the research to find out what will grow in the soil you already have. You will be pleasantly surprised to find the variety of plants that will grow with little to no help and how tasty and diverse they are! You can then spend the time to help your soil to evolve naturally over time to accommodate some more of your favorites. When building your garden beds, do not deep dig and build raised garden beds. Every opportunistic weed in the world is drawn to open and disturbed soil. Use birds, cover crops and composts to build and naturally evolve the soil where you would like to place a garden bed. Build the soil up naturally and plant your vegetables and herbs, rotating crops each season. These are just a few of the different things I’m learning as I go and there is still just so much to go. I’m only beginning to reach my hand out in order to scratch the surface of the knowledge and skill out there. My next adventure will begin at the end of this week. I will be heading back to the Ballarat area to a town called Invermay. There is a man there named Steve with a well established farm that he has built with permaculture principles. He is a part of a large ecological and permaculture community that he will be introducing me to. I cannot wait to see what comes of it. If I’m lucky I can begin to network within the community and allow people to get to know me so that I can continue to grow and learn, even when staying at a WWOOF or HelpX property isn’t possible. There are so many events and markets and things of the like that are happening every single week. I can work and volunteer and live the lifestyle day in and day out until I begin to understand. I have a long road ahead, and it’s a journey that I am enjoying beyond words, every step of the way. I hope you’re enjoying it too!